Paul Manz at Mount Olive Manz playing the works of master composers. Time: 76:05. Contents: A Little Shepherd Music - Harald Rohlig Alle Menschen Mssen Sterben - Johann Sebastian Bach Aria - Flor Peeters Awake, Thou Wintry Earth from the cantata, Praised Be the Lord (BWV 129) - J. S. Bach, arr. Roberta Bitgood Blessed Jesus, at Thy Word - Paul Manz Break Forth, O Beauteous Morning Light (BWV (248) - J. S. Bach, arr. S. D. Wolff How Lovely Shines the Morning Star (Op. 16, No. 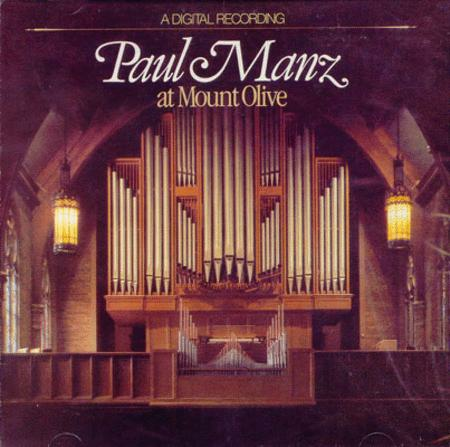 5) - Paul Manz In Dulci Jubilo (BWV 729) - Johann Sebastian Bach, trans. Robert King In Dulci Jubilo - Michael Praetorius, ed. Robert King Pastorale from the Christmas Concerto - Arcangelo Corelli, arr. James Boeringer St. Anne - Improvisation - Paul Manz Sinfonia from the Christmas Oratorio (BWV 248) - J. S. Bach, arr. James Boeringer Sonata in D (KV 144) - Wolfgang Amadeus Mozart Sonata in F (KV 224) - Wolfgang Amadeus Mozart Toccata and Fugue in F - Dietrich Buxtehude Toccata from Symphony No. 5 - Charles Marie Widor Veni Creator Spiritus - Variations - Maurice Durufle Vom Himmel Hoch - Johann Pachelbel.